The JACKPOT of all properties is what you will find here at this beautiful home located in Market Common. This is the perfect home to entertain as there is a fabulous Great Room as you enter the front door of the home with dramatic 18 ft ceilings, fireplace and lots of natural light with all the pretty windows. The home offers a large Living Room, formal Dining Room, Kitchen with breakfast area, Carolina Room, Office and covered Porch. The outdoor covered porch is decked out in a beautiful outdoor setting with a salt water pool including a large hot tub, heater/chiller, underwater lighting system, waterfall spouts and overflow spillway. Sellers had extensive concrete work done (stamped and colored with fieldstone wall) all on a remote control system. There are 3 large privacy screens that operate by remote that offers a great space for cocktails or afternoon naps. The kitchen features quartz counters, large center island and stainless appliances. All rooms on first floor features wood floors and tile in half bath. Four large bedrooms grace the upstairs including a spacious Master Bedroom & luxurious bath. The loft area on the 2nd floor measures 18'x 8' and is carpeted. The laundry room measures 8'x7' with a tile floor. Property is located on a corner lot with lush landscaping, fenced yard, irrigation and curbscaping. Home offers a whole house surge protector, security system, doggie door and air conditioning in the 2-car garage. Third car garage bay is perfect for your golf cart since Market Common is golf cart friendly and can be used to travel to the beach nearby. Sellers have not spared any expense to customize this home with upgraded ceiling fans, accent lighting, retractable screen door and gutters. There are many restaurants and shops located a short walking distance to the Market Common. Additional shopping nearby at the Coastal Grande Mall and The Myrtle Beach International Airport is a 10 minute drive. 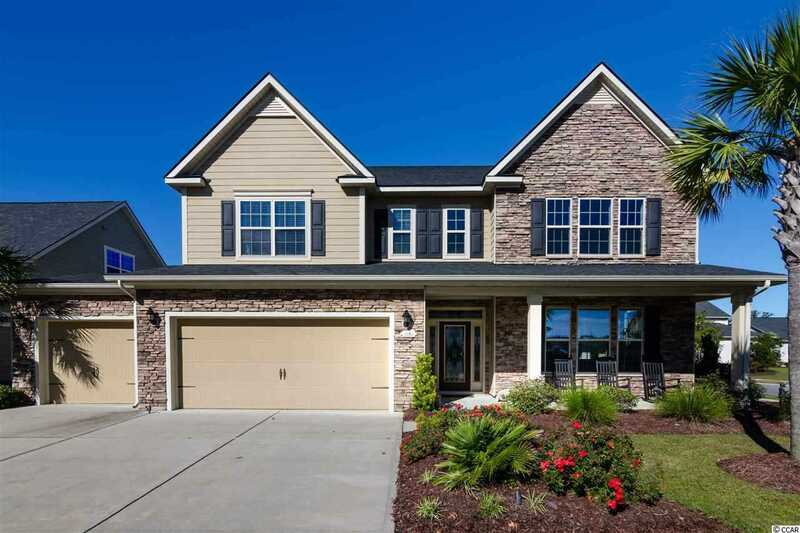 If you are looking to move to the Myrtle Beach area, especially the Market Common area, don't miss the opportunity to tour this unique and stunning property. SchoolsClick map icons below to view information for schools near 1161 Wyatt Ln. Myrtle Beach, SC 29577.